Andrew T. Berlin, owner of the South Bend Cubs, announced this afternoon that United Federal Credit Union is the naming rights sponsor for the new Rooftop Apartment Deck at Four Winds Field. Opening in June, the United Federal Credit Union Rooftop is a distinctive feature of the new Ivy at Berlin Place apartment building #2. Positioned just over the leftfield wall at Four Winds Field, it will feature space for 300 fans with a full bar, food service and grandstand. 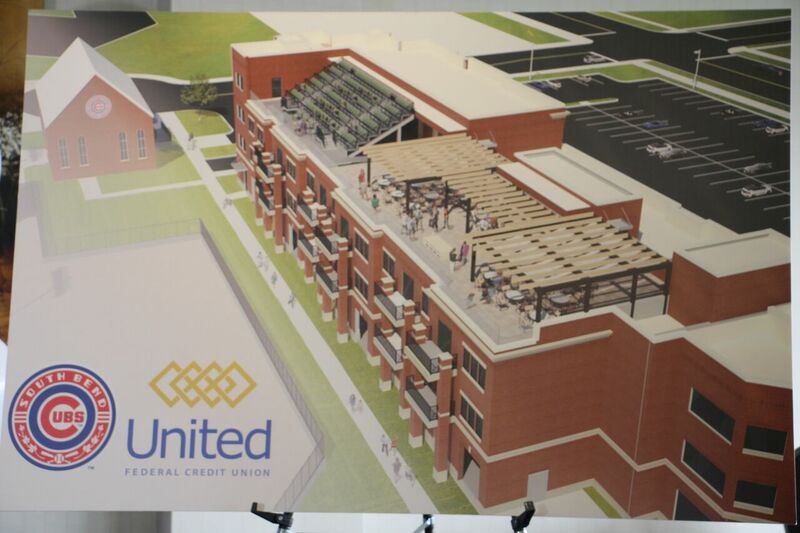 An illuminated United Federal Credit Union sign will be displayed on the south face of the building and other United Federal Credit Union branding will be featured throughout the stadium. Berlin, who is investing $23 million in the Ivy at Berlin Place apartments, will now have his own apartment at Four Winds Field. This entry was posted in Midwest League, South Bend Silver Hawks. Bookmark the permalink.